What Should You Do About Achilles Tendinitis ? 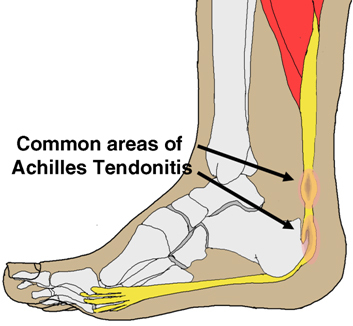 Treating Achilles tendinitis rarely requires much professional intervention. Ease the pain with OTC pain killers. Stretch and strengthen the Achilles tendon. Stop the condition from happening again. Doctors treating Achilles tendinitis will recommend the following options for accomplishing this. Pain Killers – Generally ibuprofen (Advil) or naproxen (Aleve) will ease the mild pain. Physical Therapy, Stretches and exercises devised to lengthen and strengthen the Achilles tendon will help reduce pain and prevent future recurrence. Orthopedic Supports, Heel-elevating insoles or other orthotic devices can reduce the strain on the Achilles tendon, helping ease the inflammation and pain. Posted by zoemyhr. Categories: Achilles Tendon. Tags: Achilles Tendon. Comments Off on What Should You Do About Achilles Tendinitis ?